COMMUNITY VINYASA is an all-levels Vinyasa class free for the community. These classes are often taught by visiting teachers or recent graduates of our teacher training programs. Class is free for members & non-members but donations for the instructors are greatly appreciated. VINYASA is a flowing, dynamic yoga practice that cultivates presence by connecting movement with breath. Most classes feature several elements of traditional Ashtanga yoga—including sun salutations, standing poses, preparation for arm balances, dynamic stretching, and pranayama (breathwork). This practice will build strength, aid balance and weight loss, while reducing stress and increasing vitality. In this powerful vinyasa class you will embody heroes and warriors to combat self-ignorance, build strong foundations in your warrior postures, and demystify the meaning behind the creation of Virabhadra, Siva’s spiritual warrior. Restorative acro-yoga combines the wisdom of yoga, healing touch of Thai massage and the dynamic connection of acrobatics. We will train sensitivity and stability through supported inversions and partner stretching. Trust and community are the themes of this class. Be ready to meet someone new and try something new. Troy instructs from a background in gymnastics and cheerleading with a strong focus on alignment. 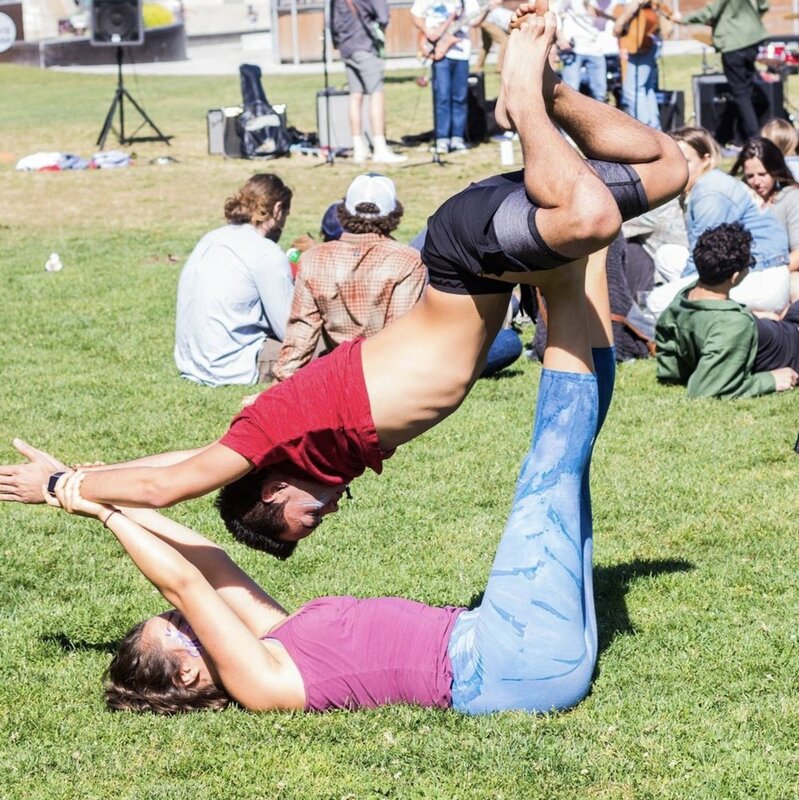 Together this dynamic gemini duo will lead a diverse, playful and interactive all-levels and all-bodies class; no partner necessary. The aim of the workshop is to build strong foundations and teach skills you can practice on your own.